DSU PBL traveled to Des Moines, Iowa to participate in the Iowa PBL Fall Leadership Conference. During the event, PBL chapters throughout Iowa came together to develop their leadership and business skills. The conference provided an amazing opportunity for DSU students to network and come together with other young business orientated individuals from the Midwest. This year, the AIB College of Business in Des Moines played host to the conference. Colleges that participated in the Iowa PBL Fall Leadership Conference included Ashford University, UNI, University of Iowa, and DMACC. 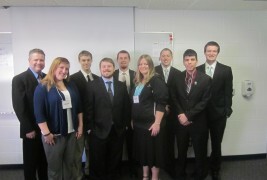 Since DSU is the only South Dakota chapter, they are considered part of the Iowa State PBL chapter. Eight DSU students and their Advisor, Dan Talley, made the six hour drive to Des Moines to participate in the annual Iowa PBL conference. After signing in Friday afternoon, the Iowa State officers opened up the general session. There were several workshops held during the conference including “Building your Persona Brand,” “Competitive Events,” “Seed Production,” “Local Officer Think Tank,” “March of Dimes – Getting on the Right Track for Babies,” amongst others. TJ Waren was the keynote speaker for the night. Mr. Waren shared his tips for finding happiness with the audience. After the keynote speaker, a club social was held at the Cherry Lanes bowling alley. During their time at the conference, DSU PBL members had a great time socializing and networking with students from across all of Iowa.